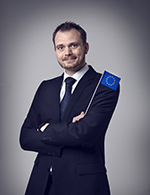 Simon joined the Danish Shipowners' Association in 2009 and took over as Head of EU Affairs one year later. He represents the interests of Danish shipowners in Brussels on all relevant topics from international trade to environment and climate. He is, moreover, a member of the management of the association. Before joining the Danish Shipowners', Simon worked as a public affairs consultant with Hill & Knowlton Brussels for seven years. Here, he headed the Food and Consumer Protection Practice Group as well as the Digital Communications Practice Group. Simon holds a BA from the Universit� Libre de Bruxelles (Belgium) and the Universidad de Granada (Spain) in political science as well as an MA in public and political management from the Institut Sup�rieur de Management Publique et Polique Europ�en (Paris). He has also served in the Danish Royal Guard.